Secular Buddhism—sometimes also referred to as agnostic Buddhism, Buddhist agnosticism, ignostic Buddhism, atheistic Buddhism, pragmatic Buddhism, Buddhist atheism, or Buddhist secularism—is a broad term for an emerging form of Buddhism and secular spirituality that is based on humanist, skeptical, and/or agnostic values, as well as pragmatism and (often) naturalism, rather than religious (or more specifically supernatural or paranormal) beliefs. Secular Buddhists interpret the teachings of the Buddha and the Buddhist texts in a rationalist and often evidentialist manner, considering the historical and cultural contexts of the times in which the Buddha lived and the various suttas, sutras and tantras were written. Within the framework of secular Buddhism, Buddhist doctrine may be stripped of any unspecified combination of various traditional beliefs that could be considered superstitious, or that can't be tested through empirical research, namely: supernatural beings (such as devas, bodhisattvas, nāgas, pretas, Buddhas, etc. ), merit and its transference, rebirth, Buddhist cosmology (including the existence of pure lands and hells), etc. Traditional Buddhist ethics, such as conservative views regarding abortion, and human sexuality, may or may not be called into question as well. Some schools, especially Western Buddhist ones, take more progressive stances regarding social issues. The appearance of secular Buddhism is understood as part of the broad trend of secularization that has been developing in the West since the recovery of classical Greek culture in the Renaissance, rather than merely as a consequence of the supposed triumph of scientific rationalism over religion in the modern period. Moreover, many aspects of secular Buddhism have been prompted by organizational developments that began in lay Buddhist practice communities (sanghas) during the last decades of the 20th century, when the hierarchical features of Buddhist monastic culture were abandoned in favor of democratic principles of civic association. In particular, the need to include women on an equal footing produced organizational innovations, which disrupted older patterns of patriarchal authority and gender exclusivity. In the 21st century, the new information and communication technologies have provided a seedbed for secular Buddhism by making teachings and discussion more freely available and readily accessible, thus facilitating the formation of virtual and actual practice communities. Today there are websites explicitly dedicated to secular Buddhism in Australia, Austria, Canada, New Zealand, Spain, the UK and the USA. Secular Buddhism has its roots in Buddhist modernism and secular humanism. The Insight meditation movement in the United States was founded on modernist secular values. Jack Kornfield, an American teacher and former Theravadin monk, stated that the Insight Meditation Society wanted to present Buddhist meditation “without the complications of rituals, robes, chanting and the whole religious tradition.” S. N. Goenka, a popular teacher of Buddhist Vipassana meditation, taught that his practice was not a sectarian doctrine, but “something from which people of every background can benefit: an art of living.” This essentially treats Buddhism as an applied philosophy, rather than a religion, or relies on Buddhist philosophy without dogmatism. Stephen Batchelor is a self-proclaimed Secular Buddhist who promotes a strictly secular form of Buddhism. Batchelor was a Buddhist monk ordained in the more traditional forms of Buddhism. From his experience as a monk practicing Tibetan Buddhism and later Zen, he felt the need for a more secular and agnostic approach. In his books Buddhism Without Beliefs and Confession of a Buddhist Atheist he articulates his approach to the Buddha's teaching, describes Siddhattha Gotama as a historic person rather than an idealized religious icon, and scrutinizes typical Buddhist doctrines dealing with the concept of an afterlife. Secular Buddhism has since spread mainly in the West. Secular Buddhism is a newly emerging, predominantly lay movement within Buddhism. Unlike the various kinds of Buddhist modernism, which tend to be modifications of traditional schools of Buddhist thought and practice in the light of the discourses of modernity, secular Buddhism is founded on a reconfiguration of core elements of the dharma itself. To this end it seeks to recover the original teachings of Siddhattha Gotama, the historical Buddha, yet without claiming to disclose "what the Buddha really meant". Rather, it interprets the early canonical teachings in a way that draws out their meaning in the Buddha’s own historical context (the culture of the Gangetic plains in the fifth century BCE) while demonstrating their value and relevance to people living in our own time. Both aspects of this interpretation are literally "secular" in that they evoke the Latin root word saeculum – a particular age or generation. The ethos of the movement is perhaps best captured in Stephen Batchelor's Confession of a Buddhist Atheist. Secular Buddhism proposes that we leave behind the metaphysical beliefs and soteriology of Indian religious culture. This culture saw human life as an irredeemable realm of suffering, from which one should seek transcendence in an enduring beyond-human condition – a stance that virtually all Buddhist schools, as well as Hinduism and Jainism, perpetuate. Secular Buddhism, on the other hand, seeks to deploy the Buddha’s teaching as a guide to full human flourishing in this life and this world. In adopting this post-metaphysical position, it parts company with existing religious forms of Buddhist orthodoxy, which have evolved since the Buddha’s death. Instead, it aligns itself with today’s post-metaphysical philosophy, not least phenomenology, so finding itself on a convergent path with similar movements in Christian thought, as exemplified by the work of thinkers such as Don Cupitt and Gianni Vattimo. Secular Buddhism likewise rejects the authoritarian structures of power legitimated by the metaphysics of orthodox Buddhist belief. It questions notions of spiritual progress based on standardized prescriptions for meditation practice, as well as the widespread idea that Buddhist practice is essentially concerned with gaining proficiency in a set of meditative techniques endorsed by the authority of a traditional school or teacher. 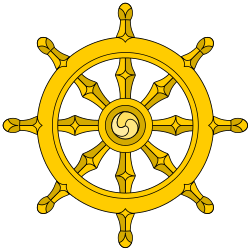 Instead, secular Buddhism emphasizes a praxis that encourages autonomy and encompasses equally every aspect of one's humanity, as modeled by the noble eight-fold path (right vision, intention, speech, action, livelihood, effort, mindfulness and concentration). Such an approach is open to generating a wide range of responses to specific individual and communal needs, rather than insisting on there being "one true way" to "enlightenment" valid for all times and places. Batchelor, Stephen. After Buddhism: Rethinking the Dharma for a Secular Age. Yale University Press, 2015. ISBN 030020518X. Batchelor, Stephen. Buddhism without Beliefs. Riverhead Books, 1998. ISBN 1-57322-656-4. Ward, Tim. What the Buddha Never Taught. Celestial Arts, 1995. ISBN 0-89087-687-8. ↑ Winton Higgins, ‘The Coming of Secular Buddhism: A Synoptic View’ Journal of Global Buddhism, Vol. 13 (2012). ↑ Stephen Batchelor ‘A Secular Buddhism’, Journal of Global Buddhism, Vol. 14, 87-107 (2012). ↑ Don Cupitt, After God (New York: Basic Books, 1997); Gianni Vattimo, After Christianity (New York and Chichester: Columbia University Press, 2002). ↑ Barry Magid, Ending the pursuit of happiness: a Zen guide (Boston: Wisdom, 2008); Jason Siff, Unlearning meditation: what to do when instructions get in the way (Boston & London: Shambala, 2010).